Tensions are high in practically every corner of the world but somehow, despite the proliferation of imminent threats, many people are still blithely unaware of the hell that could be unleashed. Due to tensions between the US and North Korea, the world is frantically preparing for the possibility of a nuclear attack. The US, China, Russia, North Korea, and South Korea have all shown force with bombers and destroyers, and it seems that it will only be a matter of time before one incident sparks a cascading explosion. The governments of these 8 places are making preparations, but they’ll be to little avail if people don’t participate and just expect to be rescued. In South Korea, their government has urged citizens to get prepared for war, and prepping is becoming mainstream for North Korea’s nearest neighbor and sworn enemy. The South Korean President isn’t taking this lying down. “In case North Korea undertakes provocations against us or our ally, we have the power to destroy (the North) beyond recovery.” This threat most likely will not please the Dear Leader of North Korea, so it’s probably safe to predict even greater hostilities on the horizon. 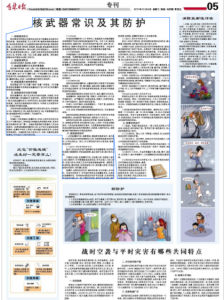 A Chinese newspaper from an area that shares a border with North Korea published a series of articles advising people how to prepare for a strike. 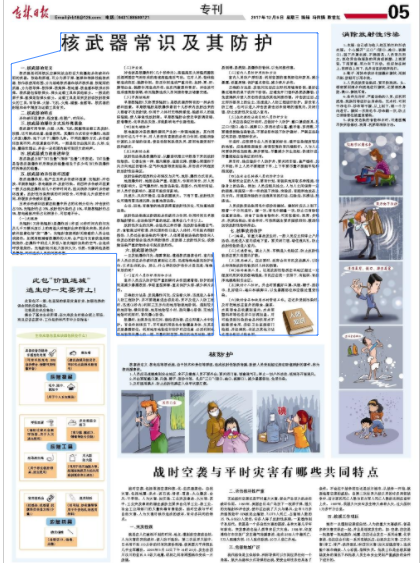 The Jilin Daily — the government newspaper of Jilin province on North Korea’s northeastern border — published articles on page 5 explaining how nuclear weapons work and the damage they cause. The paper used cartoons to offer advice on what residents can do about radiation exposure and provided instructions on how to respond during an attack. One article listed essential items for emergency kits, including fire extinguishers and breathing masks. Another warned that air raids could mean nuclear, chemical and biological attacks, and used the 1945 atomic bombing of Hiroshima as an example. Millions of people in Japan have taken part in (or soon will) nuclear attack evacuation drills, and the Prime Minister is urging local authorities to designate the best sturdy, underground sites to be used as potential shelters. …Tokyo isn’t the first city to conduct these types of large-scale drills: Towns facing the Korean Peninsula have conducted similar drills in recent months. The national and city governments are to carry out a series of exercises between January and March to prepare for a potential attack on Tokyo, the Sankei Shimbun newspaper reported, the first time that a major Japanese city will have carried out responses to a simulated attack. Towns facing the Korean Peninsula have in recent months conducted similar drills, with residents instructed to seek shelter in response to sirens warning of an imminent missile strike. But it isn’t just Asia that is preparing for the possibility of a nuclear strike. Australia recently received a warning from North Korea, calling the country a “vassal” of the United States. The minister for defense personnel, Dan Tehan, said that they “will not be cowed” by North Korea’s threats. Hawaii recently tested their nuclear sirens that have not been used since the 1980s. The island is the closest American state to Hawaii, which makes it geographically vulnerable. But here’s the bummer about the siren test. They were going for 20 whole minutes and hardly anyone even noticed them. It’s hoped that the 385 sirens dotted around Hawaii will give residents and tourists a 20-minute warning if North Korean nuclear missiles are inbound. One of my dearest friends lives in Hawaii and has attended the nuclear preparedness meetings that have been held on Maui. According to her, hardly anyone shows up. No one is interested. With that in mind, one must wonder if the issue with the lack of response to the nuke siren is one of decibels or one of cognitive dissonance. The Pentagon is planning missile defense bases along the coast. Congressman Mike Rogers, who sits on the House Armed Services Committee and chairs the Strategic Forces Subcommittee which oversees missile defence, said the Missile Defense Agency (MDA) was aiming to install extra defences at West Coast sites. “It’s just a matter of the location, and the MDA making a recommendation as to which site meets their criteria,” the Alabama Congressman and Republican said. The goal, of course, is to shoot down the missiles before they can land in the United States and cause untold damage and death tolls. It may not be that easy though. Alarmingly, several experts have raised concerns about our ability to shoot down nukes before they hit. Russia has been preparing for nuclear possibilities for quite a while now. Last year, it was reported that Russia was building fallout shelters all over the country and that 40 million citizens participated in a defense drill shortly before the US election, when tensions were running high over Syria. But it didn’t end with the election because now Russia is up to its eyeballs trying to defuse the US/North Korea situation. Russian president Vladimir Putin recently received a letter from Kim Jong Un that stated they could launch an attack on the US “at any day” and could reach the mainland. As well, Russia has voiced concerns about the animosity with NATO and recently drilled for the possibilities of nuclear or biological attacks. Russia has alleged that the US and Europe are developing nuclear weapons use procedures at their borders. Preparing for a scenario in which Russia was attacked by “weapons of mass destruction by a hypothetical enemy,” soldiers were deployed in hazmat suits and gas masks. Units specializing in chemical weapons were deployed in the Krasnodar and Stavropol regions, while at least 100 personnel in the neighboring Rostov region launched a parallel decontamination drill on Monday. It followed similar exercises held by Russian overseas troops in nearby Armenia over the weekend. Also deployed were mobile laboratories and radioactive- and chemical-tracing reconnaissance vehicles capable of quarantining, assessing and potentially eliminating a chemical or nuclear threat. As I have written numerous times, if you aren’t at Ground Zero, a nuclear strike is very survivable. It isn’t one of those situations like The Road, where the whole world is a nuclear wasteland and people start eating each other to survive. According to the DHS (source), 10 kilotons is the approximate size of nuclear weapon we could expect. Nearly everyone within a half-mile radius of the point of impact would die and most of the buildings would be demolished. This would be considered Ground Zero. With all of these governments spending oodles of money trying to prepare their citizens for the unthinkable, it would be extremely wise to get ready, just in case. In times like this, it’s more essential than ever to keep well-informed. (Sign up here for my daily emails and follow my website, Preppers Daily News.) Most importantly, go to this article to learn in-depth what you should do to prepare for the possibility of a nuclear attack. If the missiles are in the air, it’s far too late.